Finally, we begin our adventure with chickens, even though we weren't totally ready. 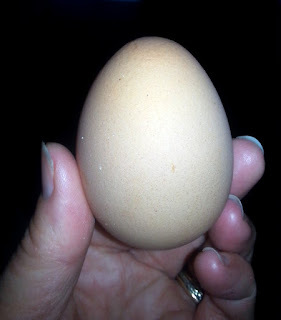 We have 5 chickens reserved to come over to our coop once it was all finished, which we thought would be this spring. However, the farm they were coming from was running into a problem. Although there was no issues last winter, this winter one of the hens was being badly bullied by the others. Poor thing had already had all the feathers on her neck pecked off and she wasn't a very happy camper. What to do? Although the coop isn't totally done we agreed to take her on ahead of the others, figuring we could make it make do, and give her a place of safety and recovery. That required two afternoons of taking care of some finishing on one corner and the window to make it so the wind wasn't howling through. A makeshift perch installed and located a large black plant pot to stuff with straw and use as a temporary nesting box. Installed one door handle, a homemade shutter to close up the window at night and in storms, and cardboard laid down as temporary flooring that can be swapped out when it gets really soiled. We still have no chicken door, only the man door. The roof has no tin, only tar paper. There is no flooring down, only bare wood (impossible to clean). No electric conduit installed, and, there is no outdoor pen yet. We won't even discuss my aching muscles after all that hammering, sawing and crawling around in a 4 foot high building. 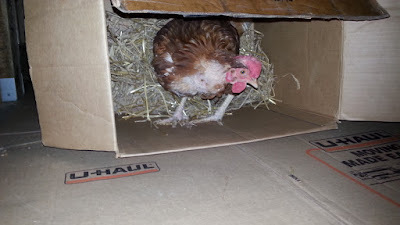 Chicken clucked nervously in the cardboard box we brought her home in and looked absolutely confused and wary when we let her out in the coop. The next morning when I stuck my head in the coop, there was one traumatized chicken. Poor thing surely thought I was the grim reaper come to take her, holding one foot up, howling and screaming, darting back and forth as I tended to the water and food dishes. And poop....EVERYwhere! Who knew a chicken could produce this much poop! I stuck my head in a few more times throughout the day to leave treats and check on things and every time she would nervously look past me wondering if she could dash by and escape. Oh the howling and screaming that went on even after I was out and the door was shut. So, scratching my head and wondering how we could ease the transition I thought perhaps a radio. In her previous home she had lots of other chickens for company (even though they were pecking her) and a radio on during the day. Suddenly alone in a strange place with nothing but silence. Who wouldn't be stressed with a change like that? Hubby was tasked with getting a cheap radio from the local thrift shop to put in there. I ran an extension cord from the workshop to the coop. screaming and howling the whole time I was in there. All the food gone I put in some more along with treats. Put the radio in and turned it on. I noticed she looked like she'd lost more feathers over the chest area and wondered if she was bored and feather picking herself. So in goes a bunch of kale tied to a rope to peck and play, along with a plastic ball. Later I checked on her and her chest was bulging in a major way. She was so swollen out on the right side that she wobbled like a drunk and I started to panic. What now??! Gotta love Google because as I searched, the situation that kept coming up was a seriously blocked crop. For those who don't know, food goes in the crop (a sort of sac) where it is jumbled around by muscular contractions that cause the food to grind against grit they've eaten and break down before moving into the digestive tract. I spent a couple of hours watching videos on how to massage the crop, turn them upside down and get them to regurgitate to empty it. All the causes from yeast overgrowth in the crop to a blockage from eating long stringy grasses that build up and rot. Another video on how to do surgery to the crop to remove a major blockage from which they can die. My head was swimming. I felt sick at the thought that here I had this chicken barely two days and already I'm in trouble. Did she have the problem start before she came? Or did I do something wrong? Meanwhile, bulging and all, she still left us another egg. She seemed lively otherwise and didn't seem sickly so we left it till morning when the previous owner would come and take a look to see what the situation was. 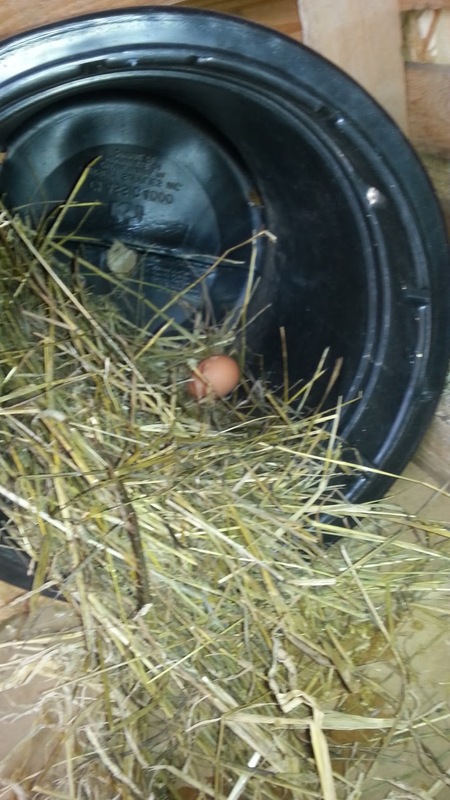 Her thought was that if she laid two eggs in one day, she was okay. Next morning early, out I went to make sure her water wasn't frozen as we'd had a little snow during the night. Lo and behold, chicken looked perfectly fine! And so it turns out I panicked for nothing, and imagined the worst. What it turned out to be was that in her previous home, the other hens pecked at her so much she really had to fight for food and likely didn't get as much as she wanted. Suddenly, here she was in an all-you-can-eat-buffet with no one to get in her way. So like an obese patron on day 3 of a lemon water diet, she dove into the buffet of pellets, grains, cooked mash, sprouts and veggies consuming every morsel in one orgasmic feast instead of picking at it through the day. Consequently she gorged so much that her crop was overfull and extended to the limit leaving her looking like a severely lopsided chicken. During the night it worked it's way into her digestive tract so that by next morning she looked like a normal chicken again. Phew! 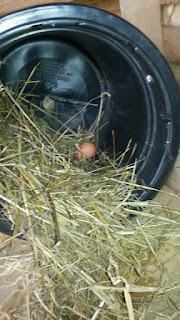 Later that afternoon I checked on her again, and she was a happy chicken now, having left us yet another egg. Until this point I couldn't even touch her but now with a full belly, toys and radio she had calmed enough to let me pet her. Tentatively at first I could only just touch her while she howled a little (though not as loud as before) and she still defensively held one foot up, eyeing me warily. 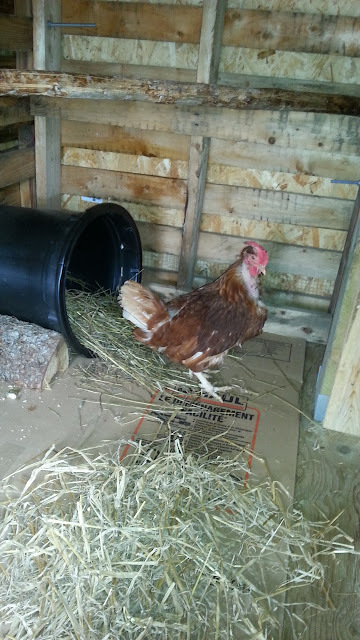 By the time I finished checking water and food dishes and adding more straw, I could pet her and she just clucked and cooed as a chicken normally does, having finally decided that maybe this new place and new owner, wasn't so bad after all. And, with this realization in place, she is picking at her food and grazing all day, as a chicken should. At least now, if a crop situation really does crop up one day (great pun, eh?) I'll know how to handle it. 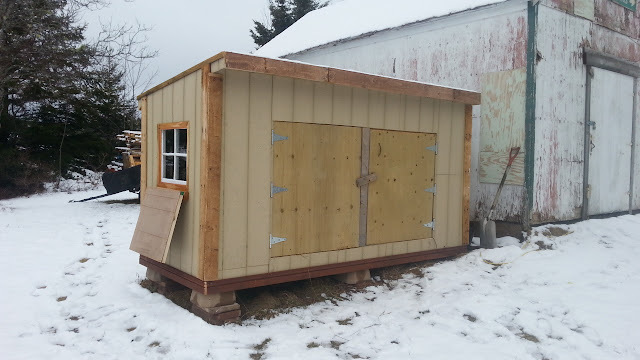 As soon as the spring weather is in full gear, we can finish the coop completely, even paint it, and then we'll be ready to get her 4 other coop mates in. Until then, she gets to enjoy a life of luxury and ease as a spoiled, only chicken. And we'll get fresh eggs. This is a further step towards improving your self-sufficiency. And a heart-warming story about a poor little chicken.